We’ve had pizza bread for dinner around here for as long as I can remember. We’ve made it with toast, English Muffins, tortilla pizza etc. My personal favorite though is French Bread Pizza. My friend Christine – The Menu Mom was kind enough to share this recipe with us. Preheat oven to 400 degrees. Slice a loaf of French bread in half, and arrange the halves on a cookie sheet. Brush a small amount of olive oil on each half of bread, and bake for 4-5 minutes until lightly golden. Spread 1/4 C of pizza sauce on each half of the bread, and sprinkle each half with 1/4-1/2 C mozzarella. Arrange your favorite pizza toppings on top of the cheese. Top with remaining mozzarella. 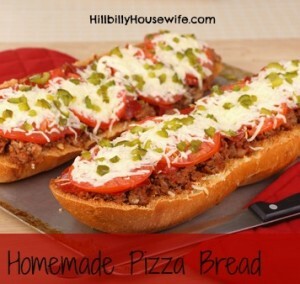 For the pizza bread below I used some leftover spaghetti meat sauce and sliced up some roma tomatoes. These are great for using up left overs. 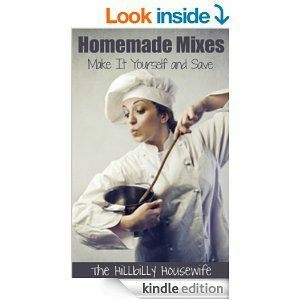 For even more quick and easy recipes, take a look at the Homemade Mixes Cookbook available on Amazon.